We finally caught up with our February Student of the Month this week! 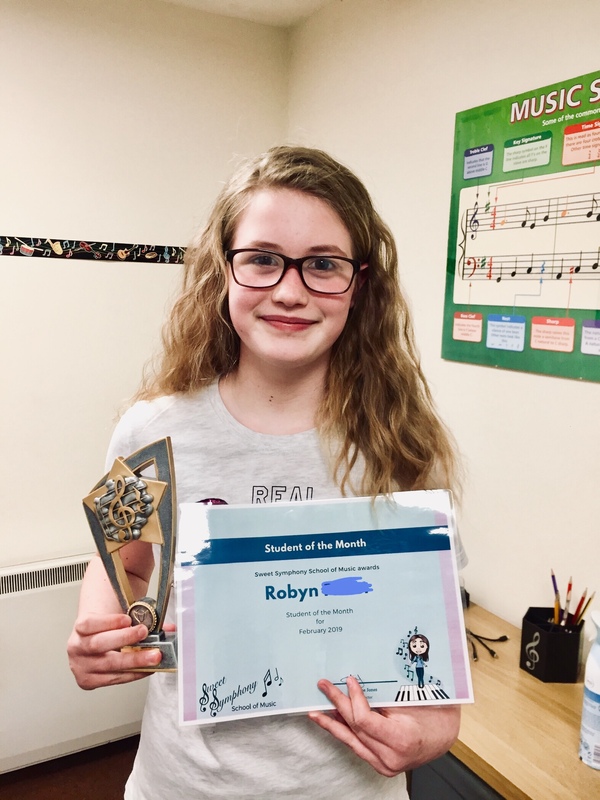 Robyn has been super busy recently, splitting her time between her piano lessons, a recent music theory exam and school commitments, and so we’ve not had chance to present her with her prize before now. It’s that theory exam that landed Robyn with the February prize – her teacher nominated her due to the great levels of work she’s been putting in for her exam, which she sat earlier this month. Robyn worked hard through several past papers, honing her answers and improving her theory knowledge. Well done Robyn and keep up the good work. We should have your theory results through in a few weeks’ time, when we’re sure your hard work will have paid off! All Students are eligible for our monthly Student prize – just impress your teacher with your commitment and enthusiasm and you could be receiving March’s reward!